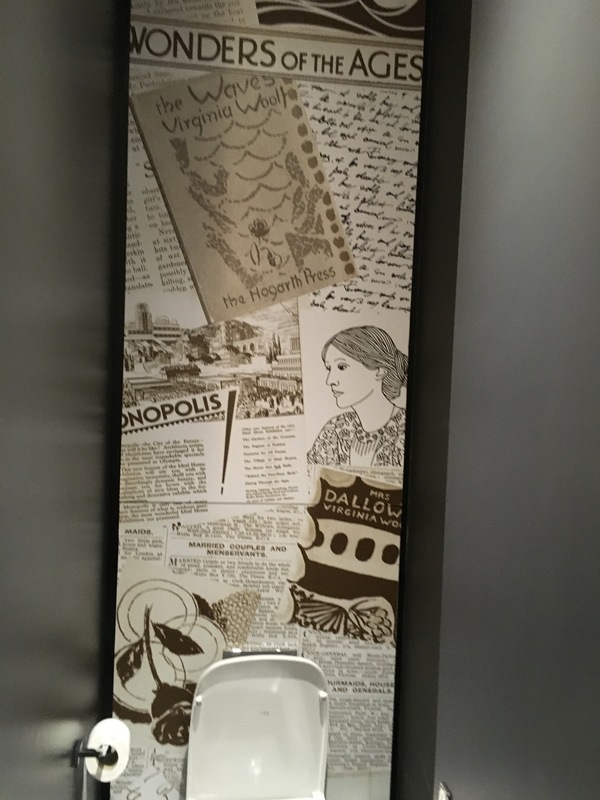 I’d heard the rumor — that a Virginia Woolf “collage” could be spotted in the ladies room of London’s Tavistock Hotel. But I did not expect what I actually found. 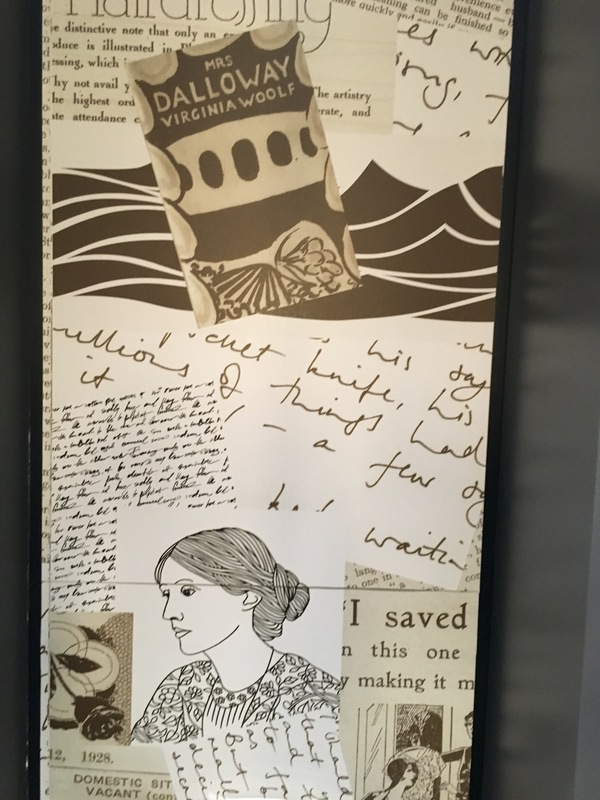 I went in search of the hotel’s unusual homage to Woolf after the 28th Annual International Conference on Virginia Woolf in June at the University of Kent in Canterbury, England. 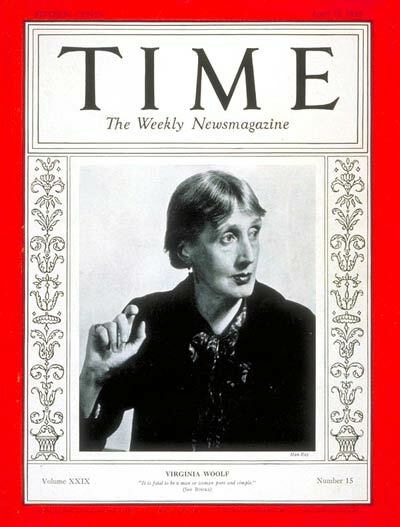 The clerk at the Tavistock’s front desk directed me to the lobby level ladies room, where I expected to see a lone framed Woolf collage on the wall near the door or the sinks. I found something entirely different. 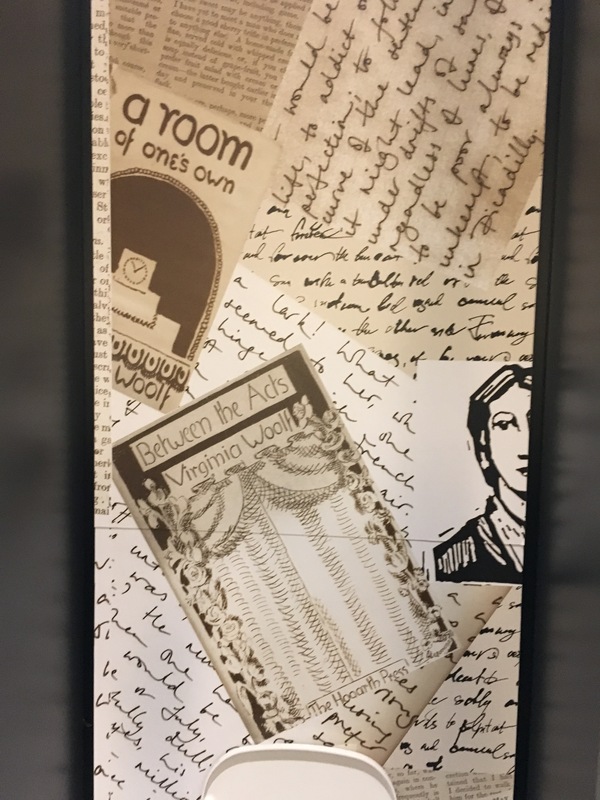 The wall behind each toilet in each ladies room stall was decorated with a long framed graphic featuring Woolf and her works. Each was cut to feature a different element of her work. Luckily, the ladies room was unoccupied when I entered, so I was able to take a photograph of each stall. However, some of my photos are a bit tipsy, due to the fact that I had to prop each stall door open with my foot while hurriedly snapping individual pictures. 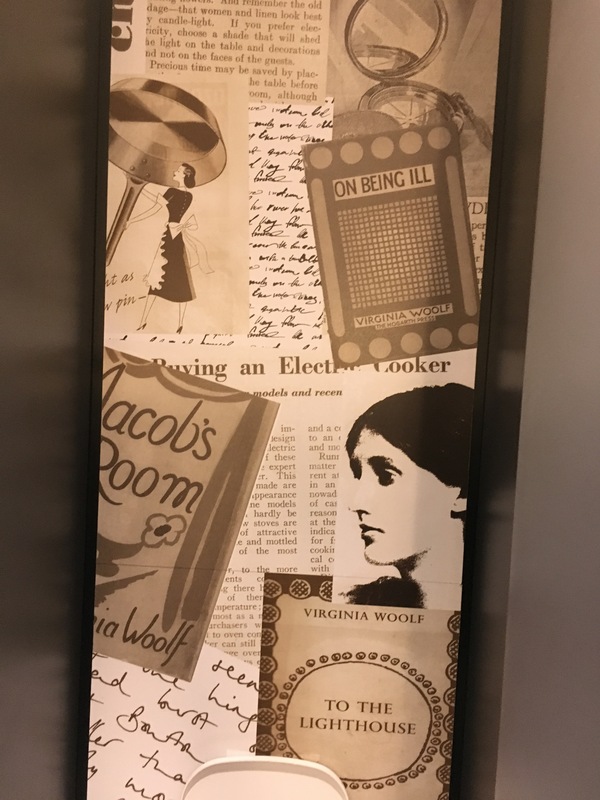 I made sure to include the commode and toilet tissue roll in the photo when I could manage it, as evidence that this Woolf sighting actually took place in a loo. 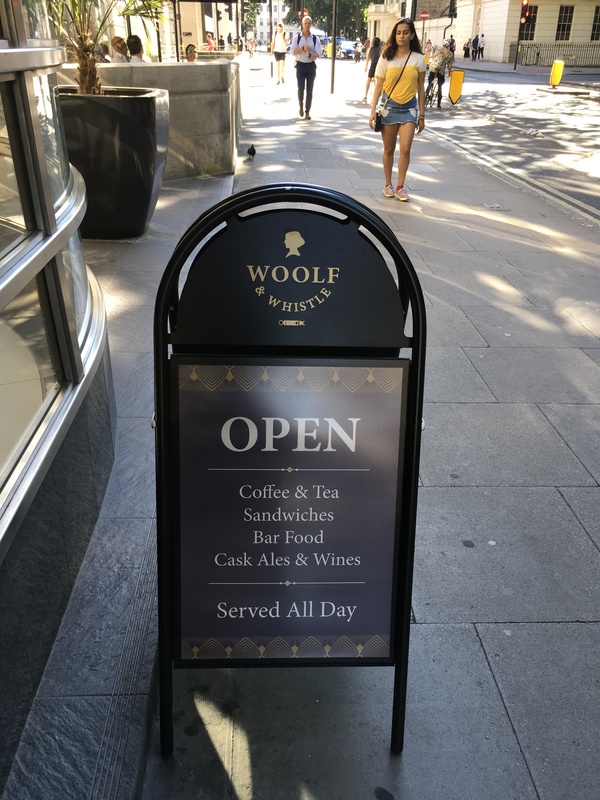 The hotel’s Woolf & Whistle serves light meals and beverages. 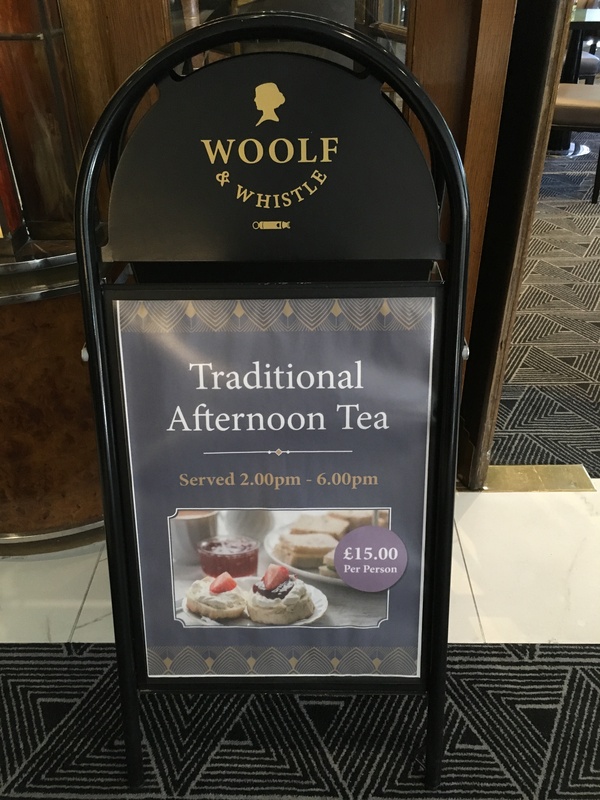 Traditional afternoon tea is also offered at the Tavistock Hotel’s Woolf & Whistle. 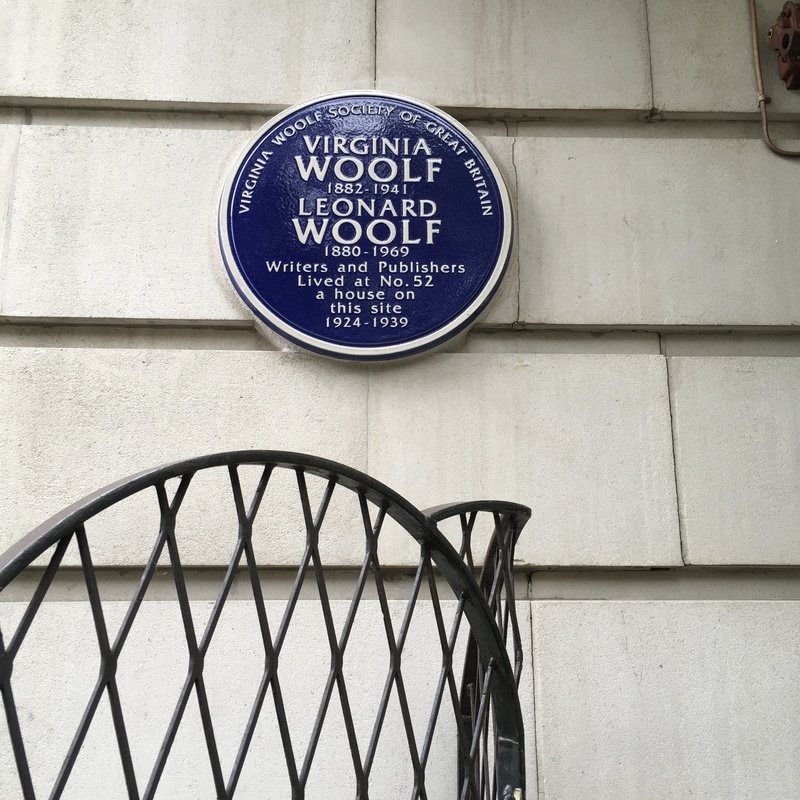 Blue plaque honoring Virginia and Leonard Woolf installed to the left of the front entrance of the Tavistock Hotel. 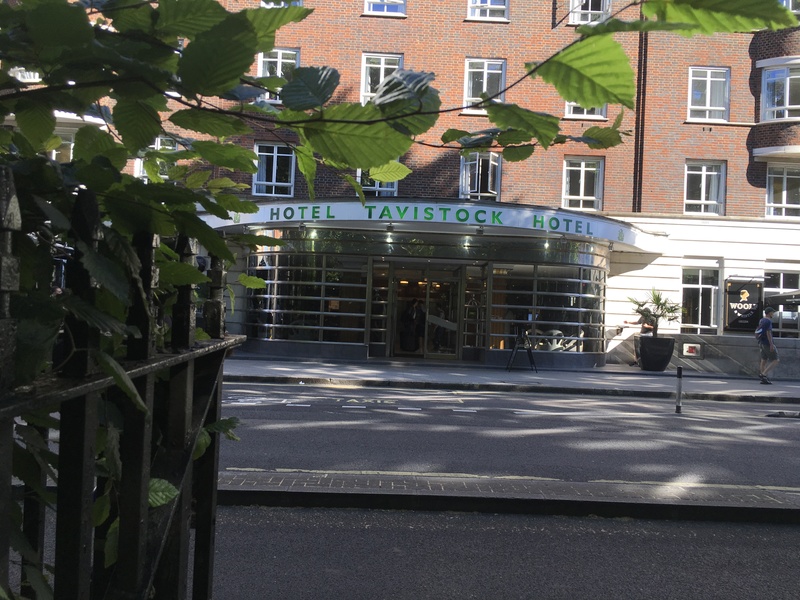 The hotel is famous because it is built on the site of Virginia and Leonard’s flat at 52 Tavistock Square, in which they lived from 1924-1939. A blue plaque commemorating that fact was unveiled on the exterior of the building in April. 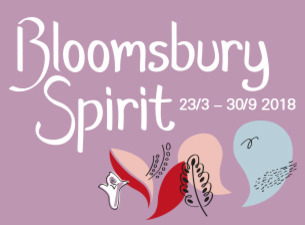 Bloomsbury Spirit is the first exhibition in Sweden of the art and home decor of the Bloomsbury Group, including a recreation of Charleston. It takes place at Artipelag, set on Värmdö in the Stockholm Archipelago, just 20 minutes from the city centre of Stockholm. Dates: Through Sept. 30. Get tickets. 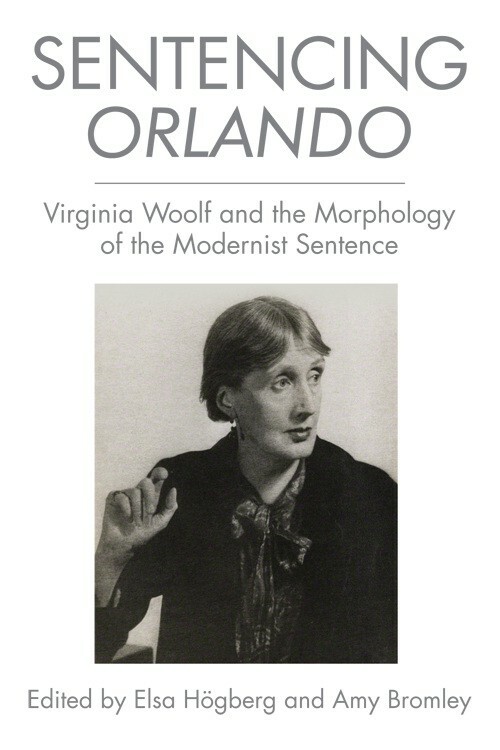 Virginia Woolf: an exhibition inspired by her writings is at Pallant House Gallery​ and features 80 female artists from 1854 to the present. Dates: May 26-Sept. 16. 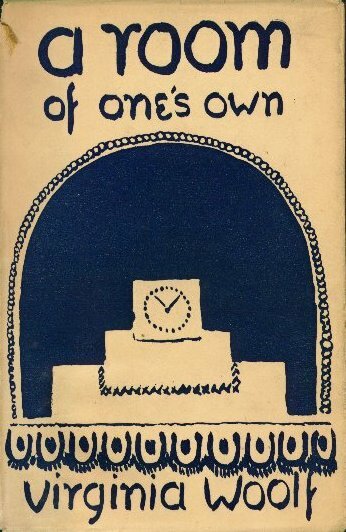 Organized by Tate St. Ives​ with Pallant & The Fitzwilliam Museum, Cambridge​. Pallant House Gallery is located at 9 North Pallant, Chichester, West Sussex, PO19 1TJ. This post is reblogged from The Charleston Attic. For the first time, a major exhibit will focus on the work of Vanessa Bell. It will be mounted at London’s Dulwich Picture Gallery and run from Feb. 8 to June 4, 2017.